Coconut. Sprinkles. Cinnamon and sugar. Need I say more? No, I didn't think so. This post is coming to you wayyy after the fact because I have been too busy enjoying this amazing spring weather and eating crafting all kinds of recipes for you. I pinky swear that's what has been going on and that there will be delicious things coming your way in the near future. I have been wanting to make doughnuts for a long time - ever since I first saw these baked doughnuts on Hannah's site, Honey and Jam. I love the idea of baked doughnuts verses fried ones. And obviously they're guilt free that way, right? And who doesn't love cinnamon and sugar? So it really was a no-brainer for me to make these. 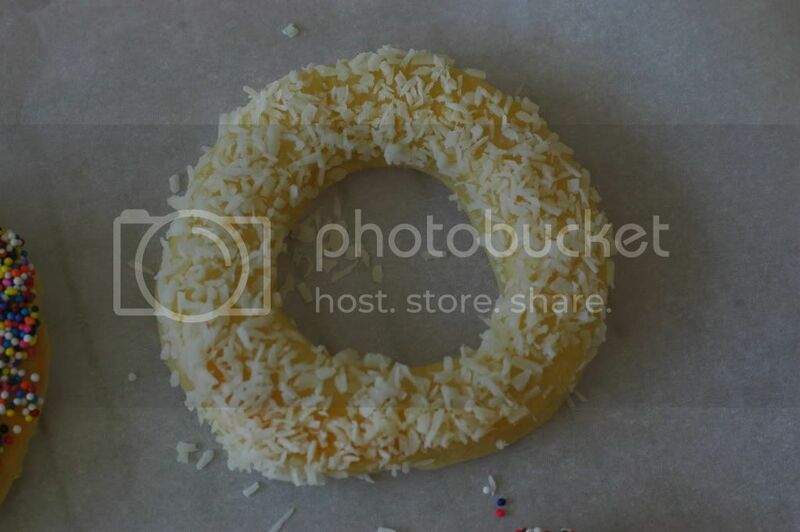 But since I love sprinkles and have a new found obsession for coconut, I thought why not use those too. Now, you might be thinking that these are not the prettiest doughnuts in the world, and I wouldn't blame you for thinking that. The crazy person in me thinks the same thing, but they were just so delicious I could overlook their imperfection. I actually thought that I was going to have perfectly shaped doughnuts because I have biscuit cutters, and I thought to myself boom - this is going to be a piece of cake. But I was wrong. I am seriously thinking about investing in a doughnut cutter, because then I would have perfectly shaped doughnut holes too. Double boom. And if you're thinking it's totally nutso for me to be obsessed with the shape of the doughnuts, you're absolutely right. But I am a little nutso, so bear with me. These doughnuts are best eaten the day they are made, preferably within a few hours. I think they would be a lovely addition to a weekend brunch. 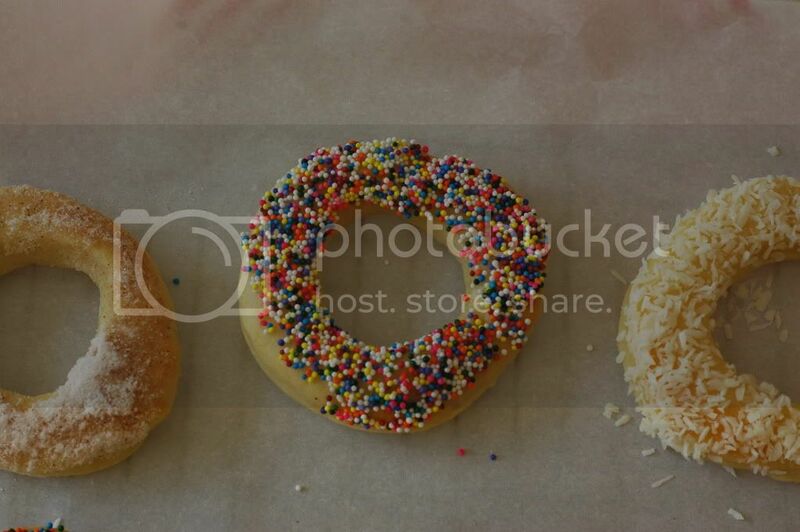 I love the colorful sprinkles, and think that they would look a-mazing on a white platter. Speaking of which, I should have thought of that sooner and photographed it for you. That's what I get for being totally obsessed with the size and shape of the doughnuts. This recipe is really simple and you could easily prep these while making the rest of your brunch recipes, and then bake and coat them at the very end. I even think this dough could be used to make something other than doughnuts, like maybe some sort of sweet roll filled with raspberry jam. Cinnamon and sugar (I just mixed sugar and cinnamon together until I had the taste I wanted. I also added a packet of vanilla sugar because I am in love with vanilla). Any kind of sprinkles (but really, aren’t rainbow sprinkles the best?)! In the bowl of a stand mixer fitted with the paddle attachment, beat the egg and sugar on medium speed until well blended, about 1 minute. Add the milk, yeast, salt and vanilla, and stir to blend together. With the machine on low speed, add 2 cups of the flour, about 1/2 cup at a time, and beat until the dough is thick and pulls away from the sides of the bowl. Switch to the dough hook. With the machine on medium speed, add the butter one piece at a time, and beat until no large chunks of butter are left in the bottom of the bowl, about 3-5 minutes. *I really found this part to be time consuming, so I recommend having the butter at room temperature for easier mixing. Reduce the speed to low and add additional flour as needed, until the dough gathers around the hook and pulls away from the sides of the bowl. It will be soft and moist, but not overly sticky. I found that I needed to add very little additional flour at this stage, but I really think it depends. Use your best judgment on how the dough feels to you. Turn the dough out onto a lightly floured surface and knead gently, until the dough no longer sticks to your hands. Lightly grease a large mixing bowl and transfer the dough to bowl, turning over once to coat. Cover with a dish towel or plastic wrap and let rise in a warm spot until doubled in volume (about one hour). After the dough has risen, punch it down and roll it out to ½ inch thickness. 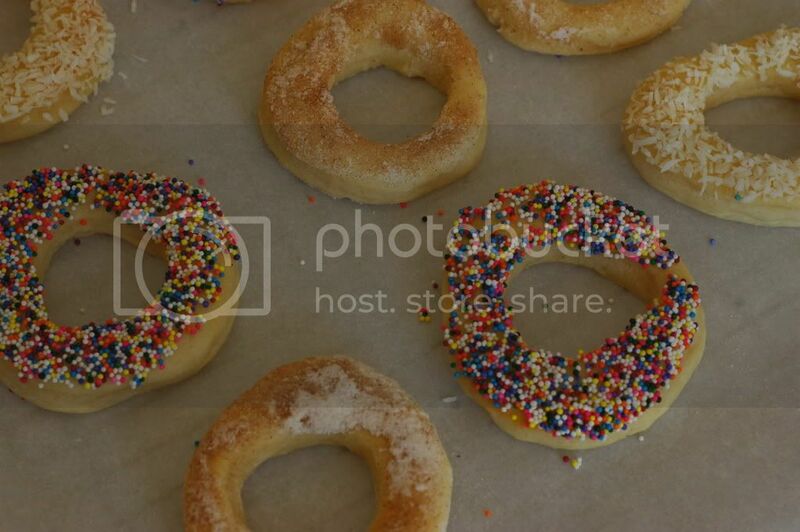 With a doughnut or cookie cutter, cut out 3 inch rounds with 1 inch holes. The dough will shrink into itself at this point, don’t worry, it will puff up again with the second rise. Preheat the oven to 400 degrees and line a baking sheet with parchment paper. Place the doughnuts about 1 inch apart on the baking sheet. Cover with plastic wrap or a dish towel, and let rise in a warm place until doubled in size, about 20 minutes. This rise is really important, so make sure to give the doughnuts enough time to increase in size. Bake the doughnuts until they are a light golden brown, about 5 to 8 minutes. Make sure not to over bake them! Immediately out of the oven, dip the doughnuts into butter, then directly into cinnamon sugar, coconut and sprinkles.